The first auction of Gerhard Hirsch Nachfolger in 2015 will encompass 1,000 Lots of antique art. The auction starts with Glass Objects, among which a rotund, hexagonal vessel from the Sassanid time, with an estimated price of EUR 2,500.-. 86: Torso of a kouros. Marble. Greek, 7th/6th century BC H. 49.5 cm. 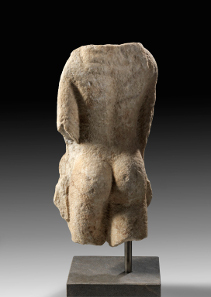 Following this, the Stone Objects, among them a Torso of an archaic kouros made of light, crystalline Marble. This piece of Greek craftsmanship from the 7th/6th century is estimated at EUR 50,000. Especially attractive is the head of a goddess created in light marble from the early Hellenistic period (late 4th-early 3rd century BC) with a valuation of EUR 10.000,-. Based on a classical Greek model, the head of a youth from the time of the Roman imperial period is estimated at EUR 5.000.-. A Fragment of a Relief from Southeast Asia depicting a scene of 9 Figures is estimated at EUR 5,000.-. After various objects from the Gandhara culture, vessels and stone weapons will also be auctioned. 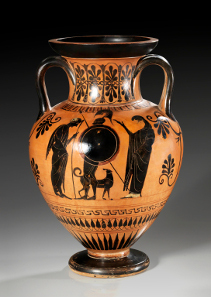 200: black-figure neck amphora. Attic, 520-510 BC H. 42.7 cm. Metal Objects are up for auction next, beginning with a bronze Statue of Jupiter from the Roman period (1-2 century BC), estimated at EUR 2,500.-. Particularly fine pieces of craftsmanship are the two bronze-plastic busts of Silenus (Roman, 2-3 century BC). These are estimated at 2,600.-. Also noteworthy are the appliqué of a vessel in the form of a sphinx. This early Greek work from the 6th century BC is estimated at EUR 3,500.-. After a series of Islamic objects and oil lamps, Weapons, Scales and Weights, Locks and Keys, a series of golden crosses go under the hammer, for example a golden pendant in the form of a cross inlayed with garnet stones (post Byzantine, Estimated: EUR 2,400.-). Subsequently Plaquettes, Mirrors and Cosmetic Utensils, Belt Buckles, Needles and Spoons, as well as Fibulas, such as a golden crossbow fibula with inscription and ornaments (Roman, 4th century AD, Estimated at 1,750.-). 607: Necklace of rotund rock crystal and gold pearls. Gold, Greek, 5-3 century BC L. 43 cm. 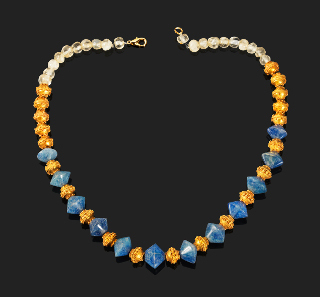 Among the Antique Jewelry coming under the hammer, a necklace of rotund rock crystal and gold pearls with granulation décor and biconical sapphire pearls is of note (Gold, Greek, 5-3 century BC), estimated at EUR 7,500.-.Another particularly attractive piece is a golden bracelet with medallions, garnet, emerald, amethyst, and glass (Byzantium, estimated at EUR 23,000.-). After the rings there will be a series of 75 Cameos and Intaglio up for auction. Noteworthy is the bust of a woman made of onyx. This piece of high quality from the 3rd century AD is estimated at EUR 1,200.-. After thede Seals, Idols and Amulets will come under the hammer, beginning with an idol made of brown stone (2nd half of the 4th century AD), estimated at EUR 2.000.-. With a valuation of EUR 4,300.- a Statue of Fortuna-Tyche from the 2nd-3rd century AD comes under the hammer. Lastly, there are is an interesting series of Aegyptica beginning with a female stucco head with ornamental painting. This object from the Roman period, 2/3 century AD is estimated at EUR 5.000,-. All antique art objects you may find on the website of Gerhard Hirsch Nachfolger.